What Is The Best Adele Album Of All Time? ...19. Now, I gotta say, I wasn't a fan of her debut. Upon listening to 19, I thought it was a decent album, just nowhere near the level of 21. I think the biggest hurdle I had to get over with 19 were the song arrangements and the track order. Now over time the album has grown on me, but there is that little something that is keeping me from truly connecting to the entire album. Once again, it has to do with the different style of songs that goes against making this one, big cohesive record. What's funny is that on the album some of the songs that I seem to be fighting against, I actually love when she sings them live. I'm talking about Crazy For You and First Love specifically. The songs that I immediately got and that still knocks me out is Chasing Pavements and Hometown Glory. To me, both of these songs are the crown jewels here. And try as you may, once you hear them, they get stuck on your head for days on end. Originally I gave 19 a 3 Star rating, but over time it has gone up to 4 Stars. Will it ever get to 5 Stars with me? Who knows? Come back in a year or two and see what I think of it then. 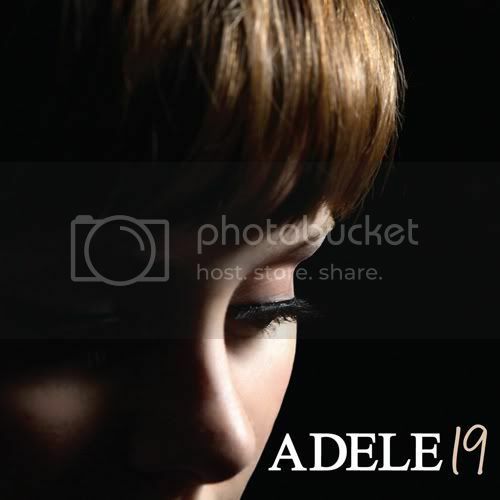 Favorite Songs: Daydreamer, Chasing Pavements, Melt My Heart To Stone and Hometown Glory. The album cover is what it is. My slowly peeling away the onion skin of Adele was slightly different. I had picked 19 up when it first came out and honestly didn't pay that close of attention to it and literally forgot about it. Then I was hearing Chasing Pavements on occasion, but with radio the way it is around here, the 'rock' stations would never play this. I don't listen to pop or top 40 stations because they irritate me. So mostly I was getting Adele music from hearing about her, sound clips from the media. I still didn't jump back. Then when 21 was getting massive attention even before it came out, I started to pay much closer attention. Rolling In the Deep which I'm sure Chip will cover just sucked me in immediately. That's when I went back to 19. I listened to it over and over. It still was not that impressive. But I have grown to love Chasing Pavements and Hometown Glory. So, what rating would you give 19? *my meh indicates that even the average song is a million times better than the forgetful crap that comes out of a majority of music today. Listening to 21, it makes me want to go back and drop a star in the rating for 19. This monster album is just worlds above her debut. The thing that makes this one so much better are the songs themselves. The have better hooks and showcase her bluesy style far more effectively. And overall, it's a more cohesive album that the first one doesn't have at all. And the other thing that makes this a winner is the track order. 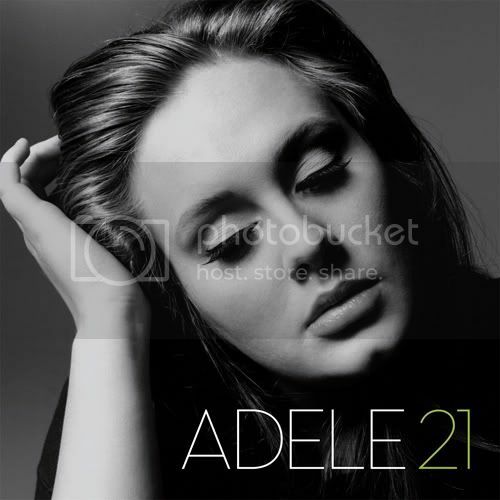 Where her debut failed in that department, 21 starts it off with the right song; Rolling In The Deep. You couldn't ask for a better song to kick things off. There are so many great songs here that I'm actually stumped at which one I would call the best. That's a very rare treat to have to face. So, I guess I could say that my favorite is............I dunno. Too hard to choose. 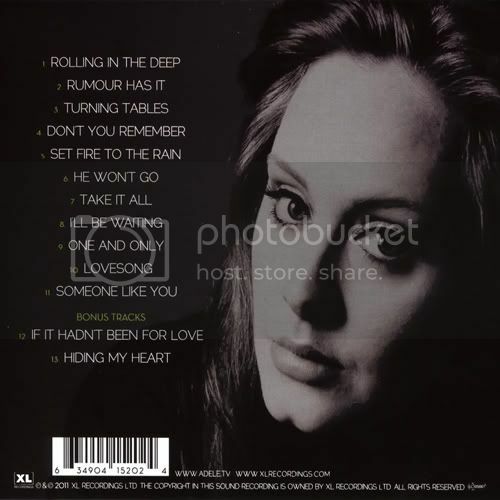 Fave Songs: Rolling In The Deep, Rumor Has It, Turning Tables, Set Fire To The Rain,One and Only and Someone Like You. Okay, I think it's a toss up between Rolling In The Deep and Set Fire To The Rain. I would say that Rain gets the slight edge on this particular day and time. Hands down favorite that sets my hair on end is One and Only. The rest of the album is stellar and enjoy them from fantastic to just great. Like many artists before her, global pop star Adele experienced a post-Grammys album sales boost, selling 730,000 copies of 21 in the past week. Unlike every other artist in history, however, Adele is the first person to sell 2 million copies of one album on iTunes in the U.S. The album, which has been out stateside since Feb. 22 of last year, reached double platinum status on the heels of Adele’s Grammy appearance: She won six awards and performed for the first time since being sidelined by vocal cord hemorrhaging and subsequent microsurgery. The new figures, posted on the Columbia Records Tumblr blog Wednesday, mark the biggest sales week for 21. The album has hit number one on the Billboard Top 200 Album Chart 21 times and has sold 7 million copies in the U.S. and 18 million copies globally. That's impressive, but I would have thought by now there would have been a few artist to already have reached that milestone. I thought the same thing. Even some of the older artists like the Beatles or Stones. But we are in a transitional period of how people hear and buy music. Lot's of factors to consider. Not like the old days of just plain album sales. The Beatles were the first guys I thought of achieving Platinum status as well as Madonna. i thought of Madonna for a nano-second. She's been out of the top of the charts for quite awhile and I don't think people are lining up in great numbers for her today. I was thinking maybe crap like Lady Gaga, Katy Perry, or Black Eyed Peas would be creating great numbers.